Positive and negative ions occur in nature. Positive ions are commonly known as free radicals that are associated with the aging process. Positive ions attract electrons from living cells rendering the cell less capable of normal cell function. Negative ions neutralize the effect of free radicals by normalizing the cells charge and increasing the cells ability to exhaust waste and intake fresh nutrients. An abundance of negative ions have been shown to improve mood, immunity, and circulation. Negative ions are naturally abundant in mountains, beaches, and waterfalls. 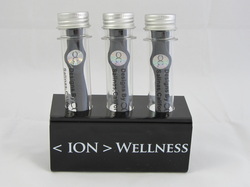 OC now offers the Negative Ion Band to help improve your well- being. Disclaimer: Negative ions are not a substitute for professional medical care and the statements above have not been evaluated by the FDA or other government agencies. Negative ions are not intended to diagnose, treat, cure, or prevent any medical conditions or diseases.